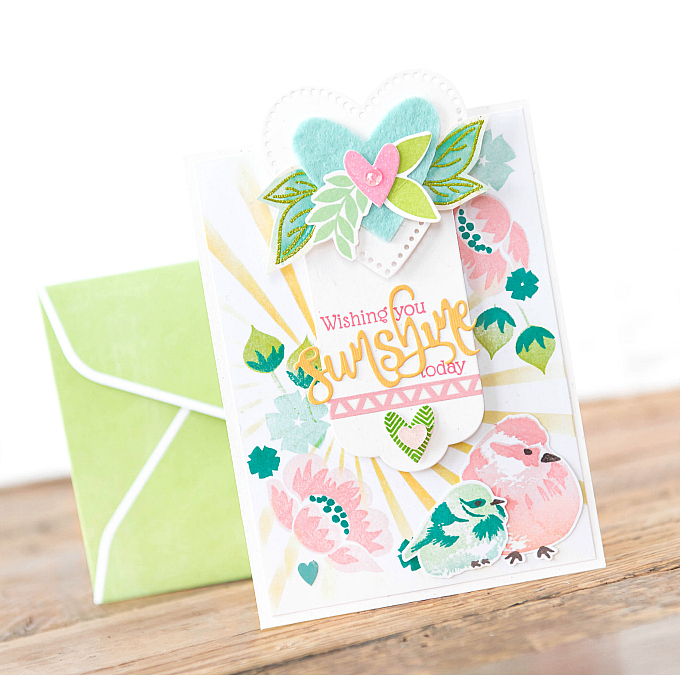 Wishing You Sunshine - Papertrey Ink Brushed Birds and an Exciting Announcement! Not too long form now, we'll be hearing chirping birds, and watching our streets come to life with sprouting leaves. It's my favorite time of year and it can never come too quickly! 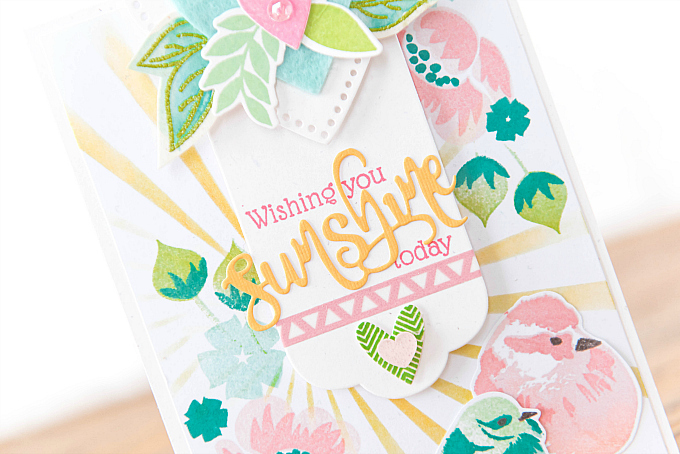 Today's card is just a little peek into the sunny days to come :) I also have another little peek into what's to come here on the blog, with a very exciting announcement below. For today's card, I used a a few different stamps and stencils to create the background. I started with a sunburst stencil from the Sunshine and Rainbows Make it Market kit, inked up with Lemon Tart and Harvest Gold ink to match the color of the bright yellow cardstock I used for the sentiment. After inking up the starburst, I stamped two floral clusters, with PTI's Gran's Garden stamps in colors of Pale Peony, Sweet Blush, Aqua Mist, Vintage Jadeite, Green Parakeet, and Tropical Teal. I also clustered together a few heart cutouts, using Limitless Layers: Heart Stitches die, Cover Plate: Hearts die, and leaves from Peonies on Parade, stamped and embossed and then watercolored. I added a couple more stamped leaves from WPlus9's Fresh Cut Florals. I used Vintage Jadeite and Green Parakeet ink. 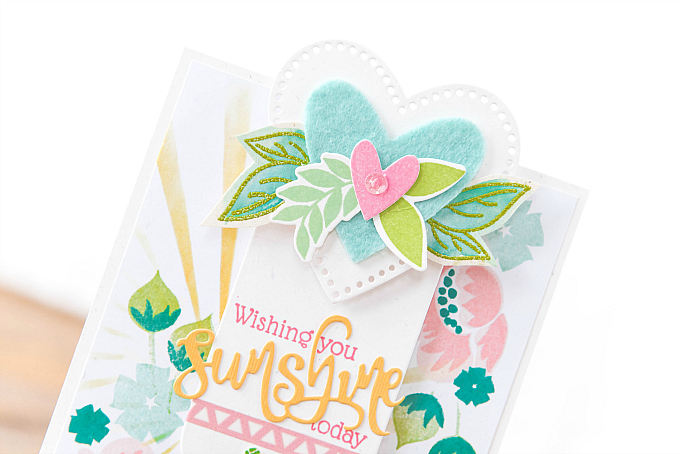 To the center of the card, I added a strip cut using the Half and Half die, die-cutting and stamping a sentiment using the Sunshine and Rainbows kit. The green heart was stamped using the Happy Hearts stamp set in New Leaf. 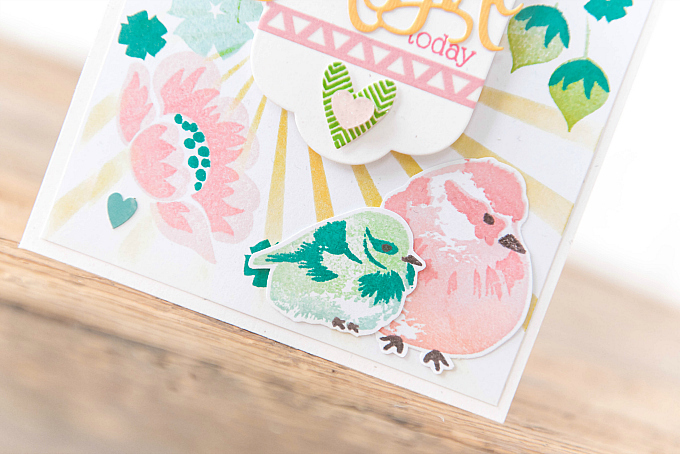 The lovely birds were stamped and die cut, using PTI's Brushed Birds stamp and dies in Sweet Blush, Pale Peony, Melon Berry, Vintage Jadeite, Aqua Mist, and Tropical Teal. I just love how vibrant and happy this card is and I hope it brings a little sunshine to your day! 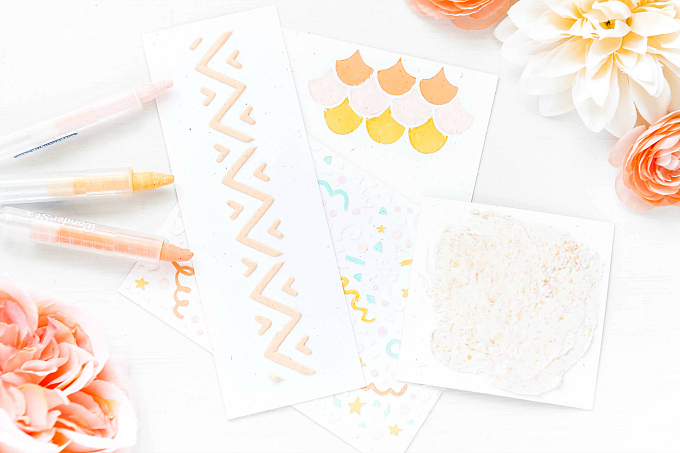 Before you go and enjoy that Friday sun, I have a very special announcement to make about an upcoming little feature, right here on my blog! A little while back, the most wonderful and splendid thing happened. My dear crafty friend, Aneta and her husband came from a very faraway place to visit us over Christmas! A long-time dream come true, turned into one of the most memorable and wonderful holidays to date. This coming Monday, we're taking a little bit of time to share our story with you, and also share a very special take on a project we started together! So please join us, for a day of stories, projects, fun and prizes! watercolor are over the top and such a fave for me~ TFS! Oh Karen, you are too kind! I'm so grateful for your visits and kind words! Thank you so, so much! :) Hopefully see you here Monday! Oh Michelle, me too! Pink birds would be delightful! Thank you so much for the kind note and I hope to see you again on Monday! Friendship is fabulous isn't it! This is a lovely ray of sunshine that will brighten the day of the recipient! Layered in prettiness! Sounds like a fun event, looking forward to it! Oh another just stunning card!! I LOVE the colors you chose and the white heart detail with the felt. All the little details are a feast for the eyes!! Nora, thank you so much for taking the time to stop by and comment! You are much too kind!